Commencing in the spring, 2017, the City of Ottawa will be redeveloping Reid Park to better meet the recreational needs of the surrounding community. 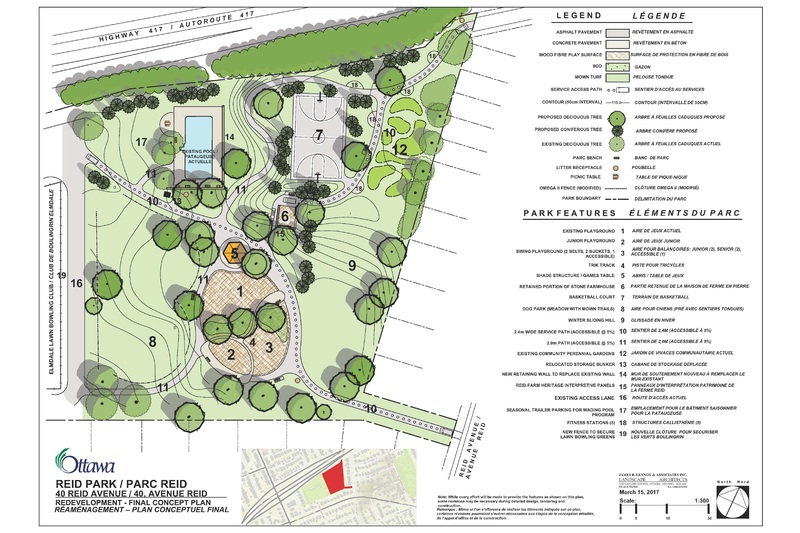 The planned redevelopment, which has been the subject of public consultation over several years, will include the installation of new play equipment, shade shelter, fitness stations, pathways, park furniture and trees; the relocation of the basketball court; the removal of the existing parking lot; the partial demolition of the existing park building (former Reid farmhouse) with the retention of its heritage stone walls, and; overall park landscaping to establish a winter sliding area and a dog park. We are pleased that work to get Reid Park redeveloped is underway! Please find attached here at the bottom of this post the final concept plan for Reid Park. Staff have also included a document detailing the environmental remediation work required which should answer any of your questions. Based on environmental studies which were completed leading up to the planned redevelopment, portions of the site soils have been found to have concentrations of metals and polycyclic aromatic hydrocarbons (PAHs) exceeding the current provincial standards for a parkland property. The park redevelopment project has therefore been expanded to include an Environmental Risk Management Program (ERMP). The ERMP is designed to mitigate future exposure to these contaminants using an approach referred to as ‘soil capping’. Please find attached here at the bottom the Executive Summary for Environmental Risk Management Program document. Regarding the activity in the park last week, City staff and the consultant were looking at the trees that are likely to be affected by the soil capping measures and trying to determine which trees may be able to be saved and those that will have to be removed and replaced. The timeline to begin construction has not changed. Staff are expecting to begin excavation of soils by the end of May, with construction continuing through to mid-November 2107. Please don’t hesitate to reach out to our office with any additional questions!